When it comes to workers’ compensation, businesses want to make sure that employees who are injured on the job are taken care of. But at the same time, who’s making sure that the businesses are taken care of, too? That’s where companies like New Mexico Mutual come in. New Mexico Mutual was set up in 1991 by the New Mexico State Legislature as a mutual insurance company to assure a competitive market for workers’ compensation coverage to New Mexico businesses of all sizes and industries. Since inception, New Mexico Mutual has become part of a solution to stabilize premium rates, improve workplace safety, and establish affordable coverage and risk management services for businesses and key critical industries operating in New Mexico and surrounding states. The company also gathers data on the New Mexico market to guide lawmakers and regulators in maintaining a compliant and fair workers’ compensation system, regardless of market cycles or challenges to maintain and attract an environment for business investment. “A big factor to our success is that we operate in a state with a small and challenging economy,” New Mexico Mutual vice president and general counsel Quinn Lopez says. 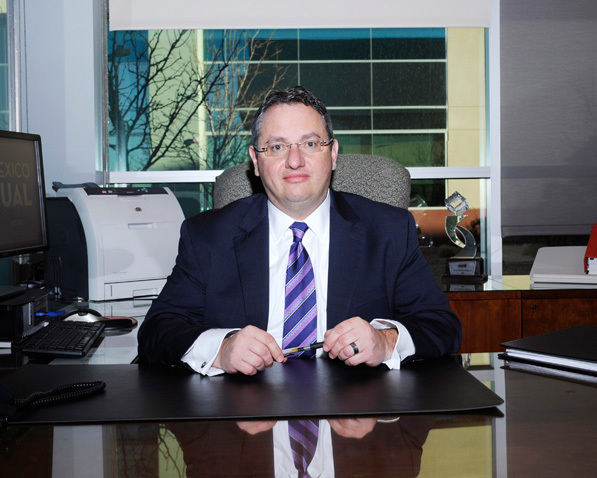 In his role, Lopez safeguards the company by assuring its best interests as both attorney and business partner. He’s responsible for the legal, compliance, and corporate governance profile of the company to support enterprise risk management and strategic business goals. New Mexico Mutual has carved out a strong position for itself in the industry since its inception. It has more than 30 percent of the voluntary insurance market in the state and retains 87.9 percent of its policyholders. New Mexico Mutual has also maintained a combined ratio of 100.2 percent and experienced favorable investment income and surplus growth in a challenging market. Good breaks and smart responsiveness have also a played a part in the company’s history. The recent boom in the oil and gas industry gave the company a chance for significant premium growth over the last two years. However, this type of growth came with an increased claim risk exposure that led New Mexico Mutual to join oil and gas businesses in stepping up to manage risks and improve safety. New Mexico Mutual also developed medical case management and other cost-containment strategies to help oil and gas businesses mitigate premium rate increases while improving medical rehabilitative and return-to-work outcomes for injured workers. Limited personnel and resources do not hold Lopez and his team back. They innovate and work with the company’s business analysis department to use data analytic tools to continuously audit and mitigate fraud, as well as outside legal and internal audit partners who are aligned with New Mexico Mutual’s goals and values. This type of forward thinking helps Quinn’s team evolve and ensure that New Mexico Mutual remains in the right direction and meets challenges head-on.